The manufacturing company had centralized resources for their IT Service Desk, networking, and application infrastructure teams, with no on-site IT resources in the sales and distribution centers. IT spent countless hours reviewing application and network system logs and diving into the backend infrastructure systems to identify the cause of the Siebel problem. They found nothing to explain it. In addition, since only the most frustrated users contacted IT, they lacked a true understanding of the extent of the problem. After months of no progress resolving users’ complaints, IT implemented Aternity Workforce APM. With Aternity’s business activity analytics , they were able to monitor several time-sensitive business activities for conformance to expected SLA targets. 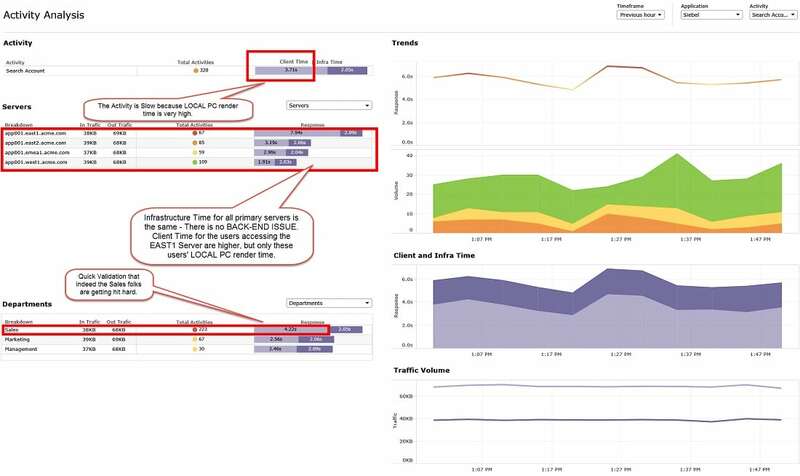 To investigate the cause of the slow Siebel business activities, IT used Aternity’s unique ability to capture the key-to-glass response time of any activity performed within any application. The slow activity was caused by the excessive time for Siebel to render on users’ screens, but the infrastructure processing time was very quick, across all servers. Only users accessing the servers supporting the East Coast were feeling the pain. Sales was the most impacted department. A quick confirmatory report showed a direct correlation between response time as the users are see it, and the local render time on their devices. With the problem validated, IT was able to let the Network team off the hook. Why hadn’t the IT team previously identified the problem’s cause? They lacked the ability to look at the users’ devices, aside from a remote session here or there. 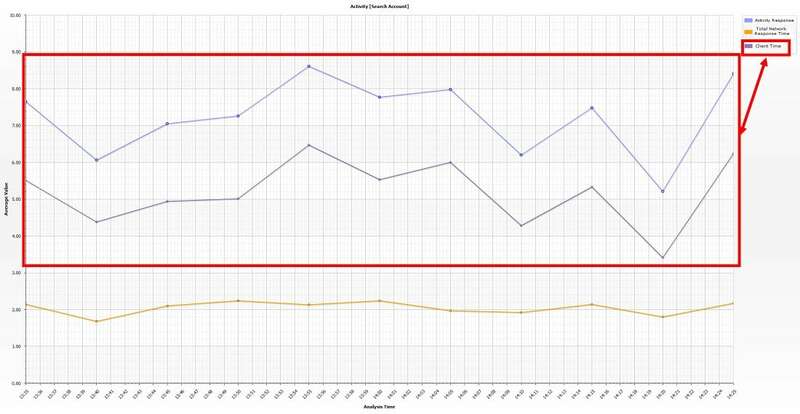 On the next user complaint, the Service Desk used Aternity to drill down to the user’s PC and confirmed that CPU Utilization was around 95% for about 40 minutes around the time of the complaint. A quick check of another user PC’s resource consumption from the same department revealed the cause – high CPU consumption due to an Anti-Virus scan scheduled for the middle of the day. A call to the central Anti-Virus solution owner within IT validated that during the last system upgrade almost 3 months before, someone accidentally set the schedule for the daily full scan from AM to PM. And as the Sales team was the first to receive the upgrade, they were the first to be impacted. IT failed to find problems that were impacting a large portion of the Sales department, or even fully understand its scope because they were not monitoring those users’ PCs at any point in time. Optimizing the end user experience of business critical applications requires more than responding to user complaints. It requires understanding the end user experience of all users, on any device, across the entire enterprise. It requires setting baselines for expected performance so that deviations from those expectations can kick off a proactive approach to problem solving. A targeted approach to reported problems is the bread and butter of every IT organization. IT frequently receives complaints from users, and investigates the problem based on reported symptoms. Spending time and money investigating in all the wrong places, simply due to the lack of visibility of where real problem may be.